Non-Toxic Munchkin: Earth Day Giveaway! To celebrate we have teamed up with peurobaby.com to GIVE AWAY A CUSTOMIZABLE JOOLZ TAILOR STROLLER ALONG WITH A VIRTUAL NON-TOXIC ROOM CONSULT BY, us, NON-TOXIC MUNCHKIN! No Purchase Necessary. Eligible only for US entrants only, ages 18+. Facebook and Instagram are not responsible for this giveaway, hosted by Peurobaby and Non-Toxic Munchkin. 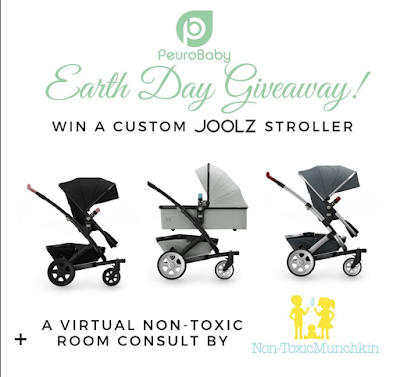 Prizes will be (1) customizable Joolz Tailor Stroller and (1) virtual non-toxic room consult. Monetary Value of the Prize is not substitutable. Contest runs from 4/22 to 5/12/18, with winner selected and announced by 5/14/18. Winner will be informed by e-mail within 1 week of selection with instruction on how to claim the prizes. Winners can enter via e-mail and will be selected at random.